When I received my first academic degree a long time ago, we were told that in America degree certificates indicated not only a command of languages such as Spanish or Mandarin Chinese, but also of Fortran and Cobol. In those days, expectations for proficiency were met equally for human language as well as computers and information systems. To learn about their limits, some of us took successfully to philosophy, such as the works of Hubert Dreyfus and Paul Rabinow. However, things rarely go as expected. More recently, there have been high hopes that cloud computing, open data, open access and big data will solve many, if not all of our problems. According to my home country Finland’s official doctrine, the ‘digitalization’ of industries, services, education and everyday life will save us, provided we can harness ourselves against the risks of hideous ‘cyber’ warfare. Will our hopes deceive us, or will our fears come true? Many have argued that within politics proper phenomena related to big data are too easily reduced to technical, commercial and administrative matters only, although a well-behaved political scientist from a small country would not shout this out in the open. I continue to see in big data good opportunities, first of all, for changing political and social research institutionally. For instance, in my current project (see ‘About the author’ below) one of our tasks is to examine long-term big data by means of machine learning and computational methods that are able to trace influences from party to government political programs (behind which underlies a coalition agreement that is traditionally implicit in our system). 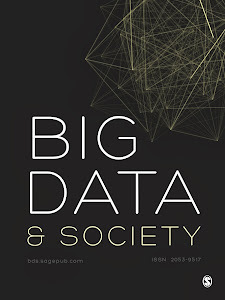 The background analysis for my BD&S article ‘Institutionalizing Big Data Methods in Social and Political Research’ evolved out of a long-term interest in proving that public finances and their management are far from boring, let alone irrelevant for critical political analysis. Moreover, in a previous study on an analogous subject matter I had accumulated frustrating experiences with the manual coding of texts. In addition, I knew that my well-behaved but marginally small country is of limited interest for the global readership, and decided therefore to do a comparative study. Last but not least, I was not happy with the common claim that data-driven research crowds out theory-driven research, and therefore decided to propose hypotheses to be tested. The feedback to my first article manuscript confirmed my expectations, if not my dormant fears, that the readiness of academia to digest research utilizing big data and using the accompanying methods deserves a serious consideration. I reframed my initial analysis by utilizing Law and Ruppert (2013) on the ‘social life of methods’ and Edwards, Housley and Williams’s (2013) division into influences of big data methods upon augmenting the arsenal of research methods, offering surrogates for existing research designs, and re-orienting research. However, wanting to be confident to my calling as a political scientist, I added an emphasis upon the ‘political life of big data methods’. My results in ‘Institutionalizing Big Data Methods in Social and Political Research’ suggest that the big data methods I examined augment and re-orient rather than offer surrogates for established research designs. Due to my interest in natural experiment designs currently popular in economics and political science, I decided to look further in particular on the design issue. My conclusions suggest that big data methods are likely to become institutionalized much like other institutional elements. In some respects, they will enhance efficiency and other types or rationality, but in others, they will support institutional legitimation decoupled from supporting rationality. Myths of rationality, called ‘rationalized myths’ in literature, can hardly be avoided in big data contexts. In certain socio-political respects, big data methods occupy performative roles in that the methods and their applications may disrupt the achieved institutionalization of research and, possibly, catalyze institutional transformations. In terms of politics, I see in big data methods a potential to provide resources for skilful actors in politics proper, and for other actors that are political in the metaphorical sense, to persuade other actors in contingent action situations. Insofar as this persuasion succeeds, change occurs as concerns of comparative power are shared between the incumbents and the challengers. Pertti Ahonen is Professor of Political Science in the Department of Political and Economic Studies at the University of Helsinki, Finland.